- 1 combination wire rack. - Handleless door/automatic door opening. 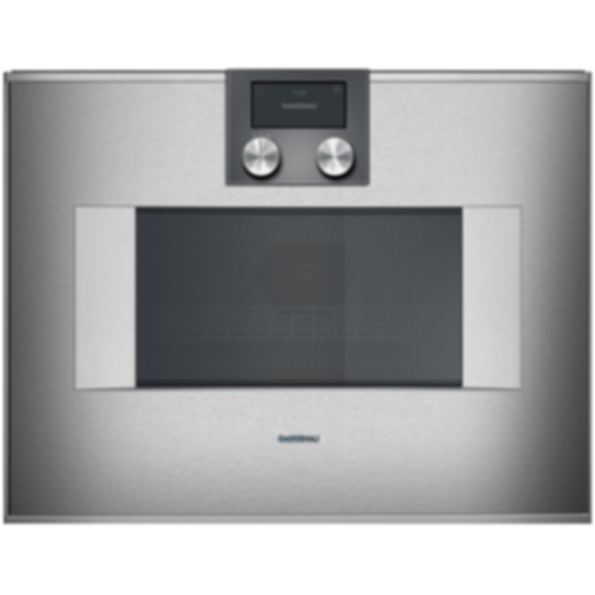 - Single operation and combination of microwave, grill and oven. - Sequential operation of up to five modes including programming of combined operation and rest time. - Centralized controls for easy use and intuitive operation. - Net volume 1.3 cu.ft. - Convection at 100°F from 210°F — 480°F. - Broil convection from 210°F — 480°F. - Broil circulated air 210°F — 480°F. - Broil with 3 levels of intensity, maximum output of 2000 Watts. Heating modes with microwave output levels 600, 360, 180 and 90 Watts freely combinable. - 7 combination programs. Option to save individual recipes. Sabbath mode with constant temperature of 185°F. - Rotary knobs and TFT touch display operation. - Clear text display in 25 languages. Information key with use indicators. Side-opening door opens up to 180° angle. - 60 W halogen light on the side. - Thermally insulated door with triple glazing.